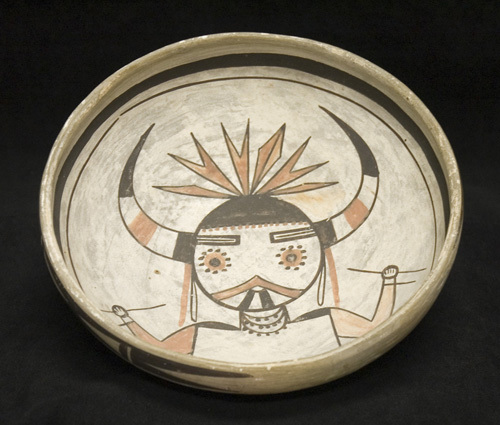 Nampeyo's name and her descendants are cultural icons of Pueblo pottery. Belonging to the Hopi First Mesa pueblo, she learned to make pots at an early age. She is credited with the revival of Hopi pottery-making in the early 20th century, a result of her great skill and innovative adaptations of traditional forms and designs. The interior of this bowl is decorated with an image of a katsina, a supernatural being embodied by masked dancers of the pueblos.